The hike to these off-trail, pothole lakes travels through the forest and an open granite landscape dotted with fantastic boulders. The forested trail easily works its way up alongside Murphy Creek with occasional views of the creek. It enters a particularly wonderful section of smooth granite as it skirts the western edge of Polly Dome. Erratics, boulders carried and deposited by glaciers, are scattered throughout the landscape. The trail enters the trees once again as you come to the first little pothole of Polly Dome Lakes. 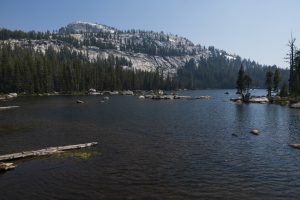 To discover the largest of the lakes, you’ll need to abandon the trail and work your way up Murphy Creek approximately 0.5mi/0.8km passing many more small bodies of water suspended in the granite. 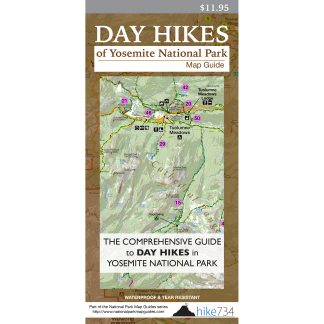 Trailhead: Look for the small parking area for Murphy Creek along the Tioga Road next to Tenaya Lake.